After being gone for years, Nicolette is going back to her hometown to help her brother deal with the growing responsibilities of caring for an aging father, a home in need of serious repairs and the daunting debts that are piling up. She needs to help him shoulder the burdens but going back to her hometown also means confronting the past. When Nic left Cooley Ridge the disappearance of her best friend was still very much on everyone’s minds. There were suspects, Nic, her brother and high school boyfriend included, but despite the searches and interrogations Corrine was never found. Once Nic arrives home and it’s as if she’s never left and the recent disappearance of a new girl will once again cast everyone in doubt and it’s as if the past is playing out all over again. Will Nic be able to deal with the suspicions and can she still trust those she has always loved? Be prepared to pay attention in this book. The story is told chronologically backwards from Day 15 to 1 and then sometimes returning back to the present, this was clever but for someone like me who reads several books at once and/or puts aside books for a few days to read others, it wasn’t a smooth read. 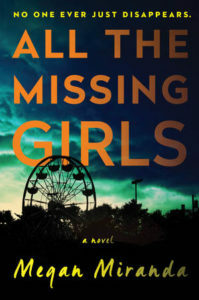 I liked the story and found myself very interested in finding out what happened to the girls but the style in which it was told wasn’t for me. I’m not sure about the style, but the excerpt intrigues me. This idea super appeals to me, but I would definitely have to “tidy my stack” to give it some serious attention. Good to know that going in! The writing style is refreshing but I’m not sure if I’ll get used to it. Still, I’ll read it at some point since I’ve this book in my pile. Jenclair – I really struggled with the writing style and it was probably my fault for trying to juggle several books. I would definitely read another of her books though! Melody – I think it wouldn’t be so bad if I had just focused on this book. Hope you get a chance to check it out!